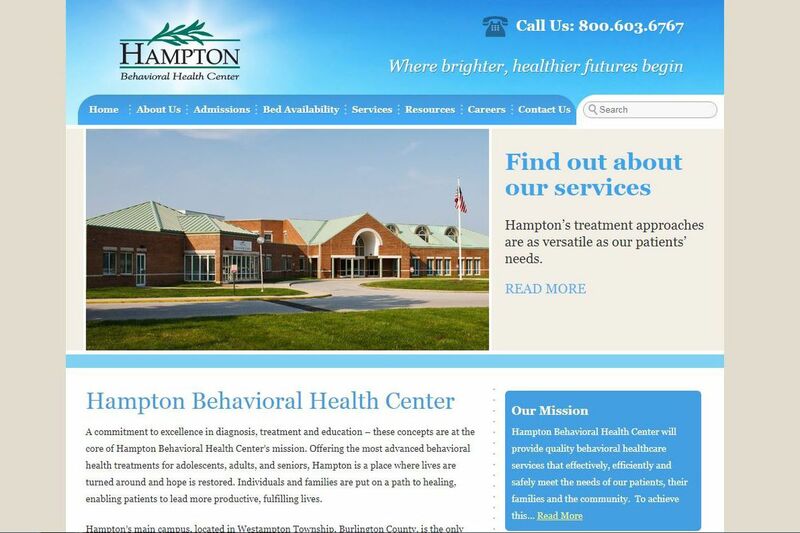 Hampton Behavioral Health Center in Westhampton, Burlington County, will add 48 beds under a plan announced Friday by the Christie administration. Universal Health Services Inc. was the big winner in New Jersey's largest expansion of its inpatient psychiatric capacity in 20 years, securing the right to add 336 beds, 41 percent of the 811 approved by the state's Department of Health. The King of Prussia company, which is the largest U.S. operator of behavioral health facilities and which has long been dogged by federal investigations of potential billing fraud, told the state it planned to open two new 120-bed facilities, in Passaic and Monmouth Counties. It also said it would expand hospitals in Burlington and Union Counties by 48 beds each. Plans for the psychiatric beds came in response to a call by Gov. Christie in January for the addition of 864 adult inpatient psychiatric beds in 14 counties for the treatment of individuals with behavioral-health and substance-abuse disorders. That push was made in conjunction with a new law that required insurers to pay for up to six months of addiction treatment. "There is an immediate need for inpatient care so people can get the treatment they need to get better and return to their communities," Christie said in a news release Friday. He said the 811 approved beds amount to a 40 percent increase in the number of inpatient psychiatric beds in the state. Providers have two years to open and license the beds. The new beds are needed, said Phil Lubitz, associate director of the New Jersey chapter of the National Alliance on Mental Illness, but he wondered whether the expansion, which is aimed at people who have insurance, will meet a major area of need. "The state is seeing that 50 percent of the people who are coming into state services with a substance-abuse disorder are on Medicaid," he said. Only 10 percent of the new capacity is devoted to the indigent and people on Medicaid, he said. In Southern Jersey — outside of Camden and Burlington Counties, where there is a surplus — state officials identified a deficit of 269 beds. Applicants could also apply for beds that would count toward the total for contiguous counties. To help fill the gap in South Jersey, Inspira Health Network received approvals to add 86 psychiatric beds at three sites in Cumberland, Gloucester, and Salem Counties, though Inspira got the nod for only 54 beds at Inspira-Woodbury, not the 75 it sought. Memorial Hospital of Salem County was approved for 26 beds. A subsidiary of Acadia Healthcare, a major national competitor to UHS, applied to enter the New Jersey market with a 96-bed facility in Vineland. Regulators approved a facility half that size. As to the fraud investigations against UHS, the state said it found nothing disqualifying at the company. "Psychiatric hospitals run in New Jersey by Universal Health Services are currently compliant with department licensing requirements," the health department said. Late last month UHS's chief financial officer, Steve Filton, told investors that the earliest the investigations, dating to 2008, could be closed would be "well into the middle of next year."